Travelling alone is not easy and this anime really shows the harsh environments and the uncertainties of like in a believable way. Kino no Tabi is just one of those anime that explores the life of a traveller. Based on a hit light novel series by Keiichi Sigsawa, the philosophical Kino's Journey employs the time-honored motif of the road trip as a vehicle for self-discovery and universal truth. Deeply meditative and cooler than zero, the series follows the existential adventures of the apt marksman Kino along with talking motorcycle Hermes as they travel the world and learn much about themselves in the process. Imaginative, thought-provoking, and sometimes disturbing, Kino's journey is documented in an episodic style with an emphasis on atmosphere rather than action or plot, though still prevalent. The anime's story is just about a girl named Kino travelling on a motorcycle through many different countries and experience the customs and getting to know the people there. How is that interesting you may ask? Well, it really depends on your point of view. If you are into deep storylines that involve heavy slice of life, adventure, and self-discovery, then this anime is for you. At first I found it quite boring to watch through, but some episodes had nice mysterious and action in them. The kind of action that the anime portray is not really your "shoot-em-up" action, but rather looking into the difficulties of being a traveller; from robbers to country conflicts, it is all there. In the end, would I say this was interesting? Yes and no. The art uses an interesting colour scheme and texture as if it was being viewed from a book. At first this seemed a bit puzzling as the imagery had full of subtle lines. However the final episodes revealed some background information about why this was so. The character detail was rather plain and I really couldn;t stand the roundish faces most characters had. Sound was decent but not that excellent. At first I thought Kino was a boy due to her melancholy mood and expressionless speech. After a few episodes it was revealed that Kino was actually a girl. That was surprising! The anime did not contain that many characters so voice acting was rather average. Theme songs were rather excellent and suited the theme really well. Characters? What characters? 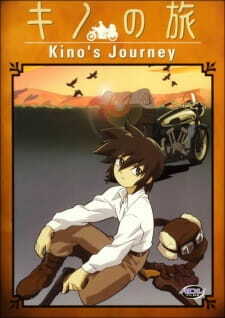 Well, the anime mostly centered around Kino and her motorcycle, Hermes. Every other character was just a "passerby" that they happened to meet throughout their travels. As a result, there were no other characters that really stood out or captivated my attention for long. Did I like Kino? Not really. She was rather expressionless and pretty boring. I still don't know why a motorcycle can talk. This is still one mystery that will probably never be solved. Overall, it was both interesting and boring at the same time. If you are not in it for the story then you definitely find this anime pretty boring. This anime is for those self-discovery individuals that just want to experience a different kind of storytelling. The anime mixes real-life equivalent events into a fictitious world and it also touches on some social issues that society faces today. For me, it was pretty boring to be honest. Some action was a nice change of pace but I really couldn't understand why Kino went on a journey in the first place. It was puzzling at first as why the art was so, but towards the end it was finally revealed why that was so. Character details were rather plain and boring. Kino's voice acting was just boring. Theme songs were decent and suited the anime pretty well. Did I like Kino? Not really? There was no other recurring characters in the anime so they were easily forgotten. The interesting part was that mostly each episode featured a different country that had its own set of customs and problems. Other than that, just watching Kino riding a motorcycle is pretty boring indeed. I don't know why people found this anime that interest to watch. Perhaps they were extremely bored or just wanted to discover themselves more. The anime was rather boring for me.